Join Organiclea’s Orchard Project to support the 200 fruit trees we have planted at Hawkwood Nursery, helping to preserve traditional fruit varieties and ensure access to local fruit for future generations. Make a gift of a tree for a birthday, Christmas or anniversary present or donate a tree to mark a special occasion or as a memorial. £20 pays for the purchase, planting and care of one fruit tree at our Hawkwood community growing site in Chingford, London. o Recipients will receive a ‘planting certificate’, and a simple slate label will be attached to the tree to mark this gift. o The recipient and donor are always welcome to visit Organiclea’s growing site on our regular open days and see our orchard taking shape and growing! The fruit from the orchard will be distributed through our locally-run vegetable and fruit box scheme and other local events which aim to encourage all to eat local fruit and vegetables in season. They will also be a valuable resource for community training courses that take place at our Hawkwood site. 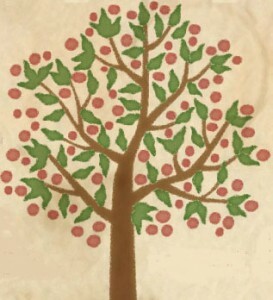 Trees that are still available for adoption include: late season apple in a traditional orchard; culinary apple varieties in espalier form around the entrance field; medlar fruit trees designed into the traditional orchard; local varieties of pear and apple tree growing in a fruit cordon; and alongside the fruit some nuts: hazelnut trees. In addition to these more traditional crops we have also planted in 2012 a number of apricots and almond trees; we have extended our pear cordons to include a number of French varieties; plum trees have been introduced to the forest garden; and a range of quince tree varieties have established well in the wetter soils. We will happily help select the fruit tree for your gift, or you can select from the list above (give 1-3 choice – we will let you know what is available).